Stainless steel HeliBar being installed to reinforce the wall. (There is a brickwork example down the page). 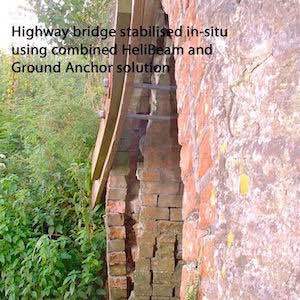 About our Brick and Stonework repairs using the Helifix system with links to photos, project descriptions and technical information. In the header photo above, “HeliBar” stainless steel reinforcement is being inserted into the bed joints of a stone wall (equally applicable to brick walls). The bars are being bedded in high strength grout which will be left recessed ready to be pointed over so that only the mortar pointing is left visible. These bars are used to reinforce and tie the building back together or to ‘stitch’ over cracks in a wall. 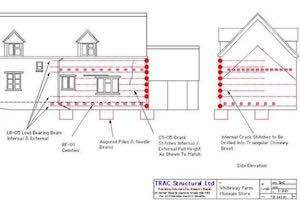 The system also provides for walls to be tied into the floors to comprehensively re-connect the whole structure. 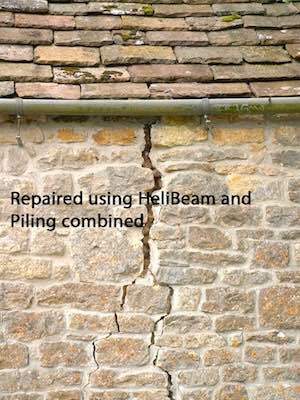 For an initial view of the type of repairs that can be carried out, use the links below to see some typical applications of the Helifix and HeliBeam systems. 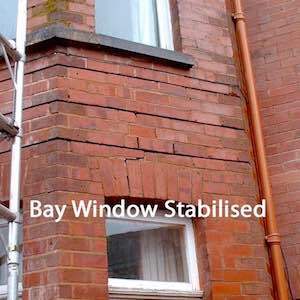 A typical bay window repair using the ability of the system to create in-situ masonry beams to strengthen and tie back the bay structure. More examples on this photo album. 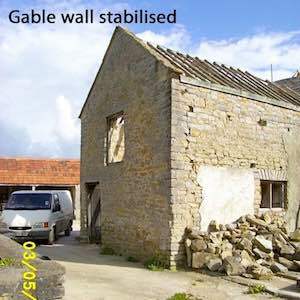 In this old barn structure, a stone gable wall separating from the main structure was tied back using the Helifix system. This project used the ability of the HeliBeam system to create in-situ masonry beams that were used to span between new pile foundations. Clicking either photo will take you to a description of the project. A combination of stonework and brickwork reinforcement together with a ground anchor installation was used to repair this small highway bridge. Clicking either photo will also take you to a description of the project. 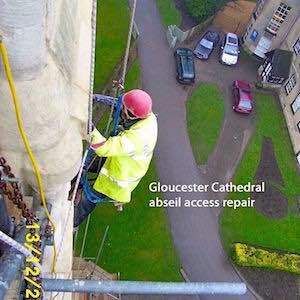 Our company name TRAC was derived from “The Rope Access Company” and we will use this access technique when necessary to carry out Helifix installations. Photos on this album. 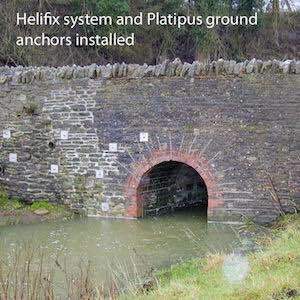 You will also find detailed examples of completed Helifix repairs on our Projects Index page and Photos Index page. 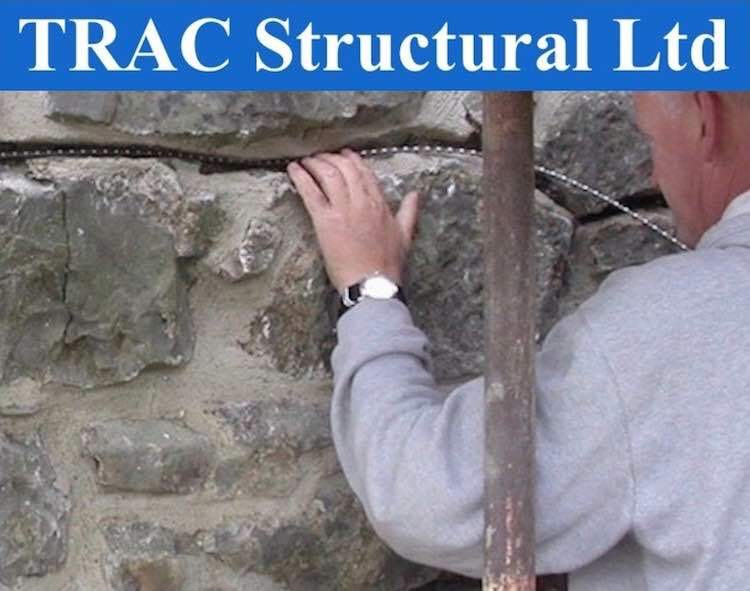 If you have a structural repair issue you can contact us immediately to arrange an inspection using the Contact Information at the bottom of the page - or follow the links below to learn more about the repair systems we use. 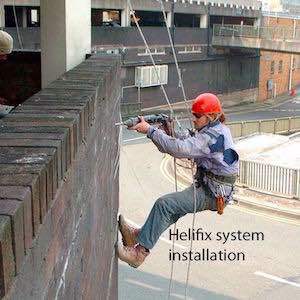 We have put more information about the Helifix and HeliBeam Systems on a separate page to expand on the descriptions above. We also have a brochure with simple diagrams that show the various Helifix applications together with short descriptions of each type of installation - download our Helifix Brochure (pdf).